Twitter has found itself under fire again. This time, it’s coming from Amnesty International, a non-governmental organization that focuses on human rights. Amnesty International’s new report, “#ToxicTwitter: Violence and abuse against women online,” details Twitter’s failures to ensure safety online and prevent violence and abuse toward women. What Amnesty International is trying to achieve with this report, the organization’s technology and human rights researcher Azmina Dhrodia told TechCrunch, is to look at why and how this is a human rights issue. By framing it as a human rights issue, Amnesty International says it hopes to be able to push Twitter to enforce its own policies consistently and be transparent about how it’s doing so. Twitter, however, disagrees with Amnesty International’s premise that Twitter is violating human rights. “The assertion that Twitter is consciously unengaged with human rights issues is an unfair representation not just of the facts, but of the ethos of our dedicated teams, and the core mission of the company,” Twitter Legal, Policy, and Trust and Safety Lead Vijaya Gadde said in a statement to TechCrunch. This report comes after Amnesty International’s 14-month investigation that combined quantitative and qualitative research. The report is based on interviews with 86 women and non-binary people, including journalists, politicians and everyday users across the U.S. and the UK about their experiences online. 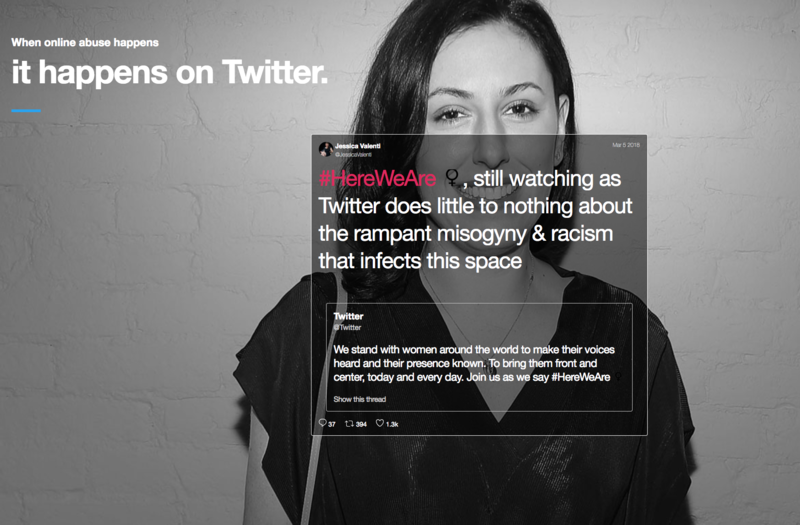 “When talking to them about their experience of violence and abuse, Twitter came up consistently as the platform where most women had experienced violence and abuse and also where they felt it was the company that was doing the least to remedy the issue,” Dhrodia said. The report goes on to outline some recommendations for Twitter moving forward. The first is to share specific examples of the type of violence and abuse Twitter won’t tolerate. Another is to share data on how quickly Twitter responds to reports of abuse, while another is to ensure its decisions to restrict certain content are consistent with international human rights law. We are committed to understanding how we can better combat the hatred and prejudice within society that gives rise to online abuse and how we can encourage a healthier public conversation. We are an open platform and hold a mirror up to human behaviors – both the good and the bad. Everyone has a part to play in building a more compassionate and empathetic society, including Twitter. Our policy, product, and engineering teams continue to work collaboratively to find ways to innovate to protect our users and enhance their experience, particularly as those in our society intent on harm find new ways to hurt and abuse. We look forward to ongoing constructive engagement with Amnesty International and others to find real, lasting solutions to ensure women are safer and feel safer online. Earlier this month, Twitter began soliciting proposals from the public to help the platform capture, measure and evaluate healthy interactions. The goal is to come up with metrics to measure the health of the interactions on Twitter. But Twitter eventually wants to take that a step further, Dorsey said in a public conversation via Periscope. As Twitter embarks on its journey to make its platform a safer, more productive place for everyone, it’s relying on third parties to step in to determine the best ways to capture, measure and evaluate health metrics. Perhaps, more importantly, Twitter needs help determining exactly what those metrics entail.